"This adventure started earlier this year. It came about because a friend of mine, Jake, who runs climbout.co.uk (using climbing and the outdoors to help people with mental health issues), started the climb 365 challenge- and another friend Mark said ”Let's do the Eiger”. The main aim of this project is to raise awareness of paraclimbing but also to show people that having a disability should not be a barrier for you in seeking out adventure. The team is made up of me, John- visually impaired 3% vision & wear 2 hearing aids, Alex Taylor who has MS & a weak left side, and Jamie Owen who has Autism. I will be helped by Mark McGowan as my sight guide, which will entail him giving me very detailed instructions on where to place my hands and feet as I climb. Mark is also my sight guide for National and International competitions, when he tells me where the holds are. He is also one of the GB Paraclimbing Team coaches and also coaches other climbers. 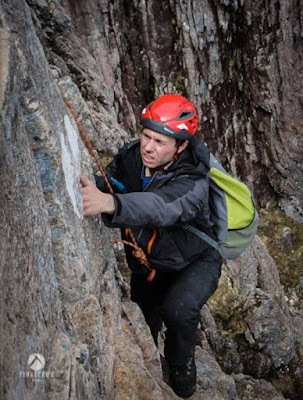 Colin Gourlay, an experienced mountaineer, will assist with the ascent. The Eigerparaclimb 2015 will be filmed by Finalcrux Films. The training started back in January with lots of aerobic exercise, I even started to do a bit of running with Mark! This was the first time in 30 years I had run. I was pleased that I could run further now than when I was at school. At the same time I am doing work on an exercise bike, cross trainer and still training at climbing as I am a GB Paraclimber. I am currently ranked as No. 3 in the world in the B2 Visually Impaired category. Back in April, Mark, Alex and I had a training weekend in North Wales where we tackled the North ridge of Tryfan, which was a success. A very detailed write up from my point of view, can be found here on our blog. We then had another training day in Scotland at the end of May in which we tackled Curved Ridge in Glen Coe. We stayed in the Jacksonville hut, accessed via a river crossing. This ascent was a ‘walk in the park’ compared to Tryfan! You can watch a short film of this here. Left: Me on Curved Ridge. We are now in the final stages of preparation for our ascent of the Eiger. The team have gotten fitter, and we are getting our gear together. The team would like to express a very big thanks to Lifesystems for their support with the @eigerparaclimb which takes place this July." Lifesystems are keen to be supporting John and his team in their Eiger challenge. You can read Jerry Gore's recent account of ascending the Eiger here, too. To find out more about the Paraclimb you can follow them on Twitter @Eigerparaclimb or visit their blog.